DETROIT (AP) — Matthew Boyd pitched well on Jack Morris Day, but he was still worried about disappointing one of his idols. “I think he might be mad at me for only pitching six innings,” Boyd joked after the Detroit Tigers beat the Minnesota Twins 4-2 Sunday to win the weekend series. The game started 20 minutes late because of the ceremony to retire Morris’ No. 47 jersey. Morris and longtime teammate Alan Trammell were inducted into the Hall of Fame earlier this month. Boyd (7-10) won for the third time in four starts, giving up one run on two hits and a walk in six innings. He struck out three. Boyd has talked to Morris several times for pitching advice, even though as a finesse lefty, he’s not much like the famed righty. “The theme of every conversation we’ve had is competing,” Boyd said. “Compete on every pitch, don’t get pushed around or intimidated and give your team a chance to win. “It was special to be able to go out there and pitch like that on his day,” he said. Shane Greene pitched the ninth for his 25th save. Kohl Stewart (0-1) took the loss in his major league debut, allowing three runs on eight hits and a walk in 4 1/3 innings. He started his career with four scoreless innings, but after he got the first out in the fifth, the next five batters reached base. Twins manager Paul Molitor said Stewart should get at least one more start. The Twins took a 1-0 lead in the second when Mitch Garver tripled over JaCoby Jones’ head in center field and scored on Johnny Field’s sacrifice fly. Grayson Greiner, Victor Reyes and Jeimer Candelario hit three straight singles with one out in the fifth to tie the score. Jose Iglesias beat out an infield single on the 10th pitch of his at-bat, loading the bases, and Niko Goodrum walked to give the Tigers the lead and end Stewart’s debut. Victor Martinez greeted Taylor Rogers with a sacrifice fly, making it 3-1. Max Kepler led off the eighth with a homer off Joe Jimenez, pulling the Twins within a run, but Ronny Rodriguez made it 4-2 with an RBI double in the bottom of the inning. Twins: LHP Adalberto Mejia (wrist) will have an MRI on Monday in Minnesota to try to determine a recovery plan. Tigers: Jones left the game after the third inning with a right hamstring strain. He injured himself chasing down Garver’s triple in the second inning and was undergoing tests after the game. Morris became the sixth Tigers player to have his number retired, with Trammell’s No. 3 scheduled for Aug. 26. Detroit has also retired manager Sparky Anderson’s No. 11 and a blank jersey for Ty Cobb. Morris, who won World Series championships for the Tigers (1984) and Twins (1991), finished his speech by thanking both teams. “It is a great honor to have this day in the city where I spent most of my career, and in front of two teams I love. Thank you and go Tigers and Twins,” he said. The Minnesota native will be honored by the Twins on Saturday, also before a game with the Tigers. Twins: Off on Monday before starting a two-game series at home against the Pittsburgh Pirates. Jake Odorizzi (4-7, 4.50) will start Tuesday against Pittsburgh’s Jameson Tallion (9-8, 3.83). 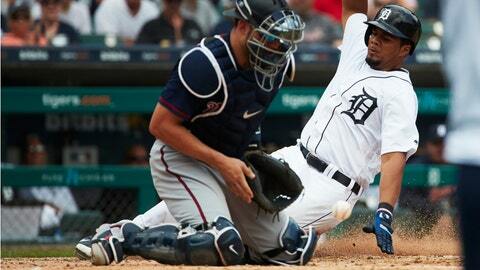 Tigers: Start a three-game home series against the Chicago White Sox. Artie Lewicki (0-2, 4.76) will pitch for Detroit against Reynaldo Lopez (4-9, 4.30).